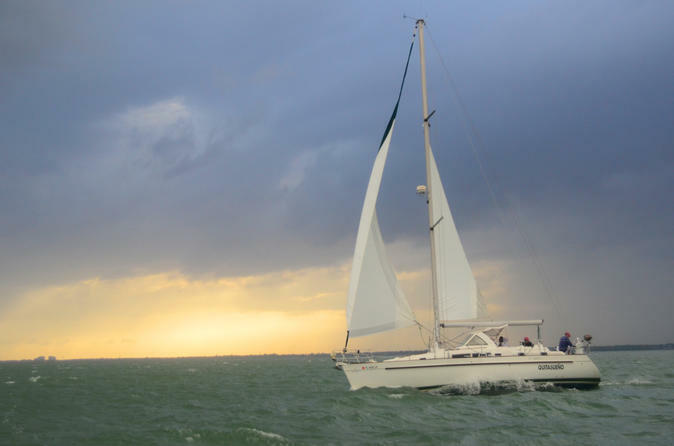 Set sail on a private 40-ft sailboat for 4 hours on Biscayne Bay with this charter from Miami. Choose from a morning, afternoon or evening sail and enjoy a great and relaxing time...See beautiful views of the Miami Skyline, Brickell, Key Biscayne and it's mansions and the historical landmarks of "Stiltsville", and Cape Florida Light House; depending on the route taken guests will have these and many other places to see. End the day observing a gorgeous Florida sunset while on board. Sailing provides the perfect atmosphere to relax and get away from it all so sit back and relax on this private charter on Biscayne Bay in Miami. Choose between a morning, an afternoon or evening departure and capture either a gorgeous Floridian sunset or lay underneath the stars. You may enjoy delicious refreshments such as a cheese platter, fruit, chips, soft drinks, lemonade, and water You are also welcome to bring your own food or beverages, including white wine or champagne. Lunch and dinner are available upon request (additional cost) . Itineraries can be customized, however it may be adjusted depending on the weather. Choose to stop at an exotic Island and explore a beautiful bird sanctuary. Visit "No Name Harbor" where calm waters makes it a great smooth sail and surround yourself by mangroves and great sunsets. The choice is yours!